BPP University School of Health is collaborating with the British Medical Journal to publish a series of major new reference titles across a number of subject areas. Each volume presents a range of important reference material on specific clinical topics the content of which has been carefully selected from the wealth of information contained in the extensive recent archives of the BMJ and published in the various editions of the journal. These books will provide an invaluable reference source on current best practice for all clinicians. 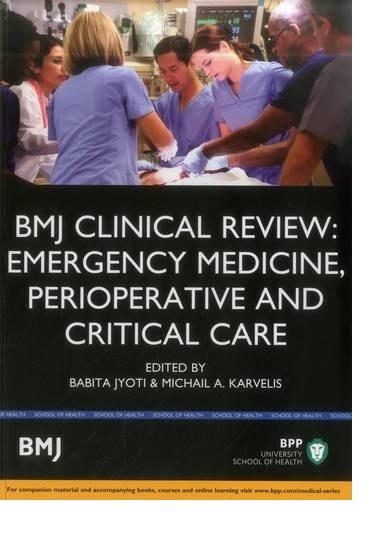 This book presents a collection of carefully selected clinical reviews published in the British Medical Journal focusing on emergency medicine, perioperative and critical care written by highly recognised authors from different backgrounds. It deals with a diverse range of traumas which can be presented in emergency medicine and discusses the appropriate treatments to manage them.Subjects discussed include; emergency and early management of burns and scalds, early fluid resuscitation in severe trauma, cardiopulmonary resuscitation, prehospital management of severe traumatic brain injury, treating the effects of exposure to tear gas, pain management and sedation for children in the emergency department, central venous catheters, paracetamol poisoning, hyperkalaemia, managing anaemia in critically ill adults, laryngitis, viral meningitis, spontaneous intracerebral haemorrhage, cauda equina syndrome, ventilator associated pneumonia, spontaneous pneumothorax, diagnosis and management of pulmonary embolism, aortic dissection, diagnosis and supraventricular tachycardia, extracorporeal life support, refeeding syndrome: what it is, and how to prevent and treat it and the role of interventional radiology in trauma and anaphylaxis.